A stay at Pousada Palacio De Estoi - Monument Hotel & SLH places you in the heart of Estoi, steps from Estoi Palace and close to Ruins of Milreu. This 4-star hotel is within the vicinity of Sao Miguel Peak and Novacortica Cork Factory. Satisfy your appetite at the hotel's restaurant, which serves lunch and dinner, or stay in and take advantage of room service (during limited hours). Relax with your favorite drink at a bar/lounge or a poolside bar. A complimentary buffet breakfast is included. 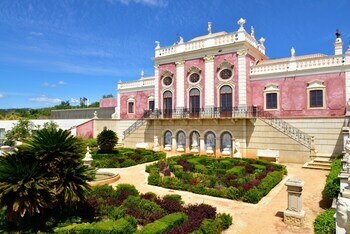 Pousada Palacio De Estoi is an amazing Faro lodging choice for your trip to Portugal. With numerous amenities for guests such as 24 hour front desk, fitness center, jacuzzi or spa, you will wake up at Pousada Palacio De Estoi feeling ready to go every day for your time in Faro. Don’t let this amazing reservation opportunity pass you by, book your stay at Pousada Palacio De Estoi today to make the most of your time in Faro, Portugal.